This article is about the final level in Donkey Kong Country. For the ship itself, see Gangplank Galleon. 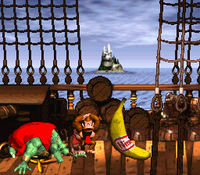 Gang-Plank Galleon is the final boss level of Donkey Kong Country. The Kongs must defeat King K. Rool for the bananas. Unlike all other levels in the game, it is accessed directly from the overworld map of Donkey Kong Island. 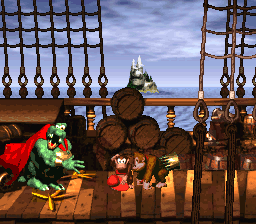 As with the world boss fights, on entering the battle, if the player enters with a single Kong, a DK Barrel is instantly broken to ensure they start the fight with both Donkey and Diddy. After he lands on the deck with a crash, King K. Rool will throw his crown across the deck, damaging the Kongs and causing them to either run away (if both Kongs are present) or lose a life (if only one is there). While his crown is off his head, the Kongs can jump on him - jumping on him while he is wearing the crown also hurts the Kongs - whereupon the crown will teleport back to his head and he will run across the deck. He will repeat this twice, dashing back and forth twice after the second hit and three times after the third, speeding up on each added dash, during which the Kongs must avoid him. After the fourth hit, instead of running when his crown reappears, he will instead bounce to the other end of the deck, after which oversized cannonballs will fall from the rigging, sequentially moving away from him. He will then repeat this sequence - throwing his crown, jumping and triggering cannonballs - twice more, with the cannonballs sweeping across the deck twice (back and forth) after the next hit, and three times after the following hit. NOTE: If the player dies after this point, the "kredits" will not roll again on reaching this stage of the battle, although K Rool will still fall briefly. In the Game Boy Advance version, the battle simply restarts from this point. King K. Rool is defeated. K. Rool will then revive and quickly jump around to the far side of the deck before throwing his crown again. Upon being jumped on again, he will repeat this on his first pass, but then return with shorter bounces which are harder to avoid. After the next hit, he will reprise these two passes, before a third pass with still shorter bounces. Finally, he will throw his crown once more, and when jumped on, will cry out several times before fainting for real; a Giant Banana then falls from above and the Kongs celebrate victory. They will then go to Cranky's Cabin, where the old Kong will congratulate them, and tell Donkey to check his Banana Hoard, which is now full again. Then, finally, the real credits run. An arranged version of Gang-Plank Galleon's self-titled music is featured as a track in Super Smash Bros. Brawl where it plays on the Rumble Falls stage, in Super Smash Bros. for Wii U on the Kongo Jungle stage, and in Super Smash Bros. Ultimate on any Donkey Kong stage, under the name "King K. Rool / Ship Deck 2." A new arrangement is also featured in Super Smash Bros. Ultimate under the original music title. In addition, King K. Rool's victory theme is an excerpt of Gang-Plank Galleon's music. In the Game Boy Color version of the game, the theme is taken from the ship levels in Donkey Kong Land, which itself is based off of Gang-Plank Galleon's original theme. However, it lacks the segue into the higher-intensity loop, simply playing an extended version of the more cheery opening. This page was last edited on April 12, 2019, at 04:06.